At Skin Renewal, with combination treatments every 2-4 weeks, in 3-6 months we can take almost any skin to the next level: luminous, smooth and tight. With combined treatments which include Laser Genesis, the prospects of "the perfect skin" are now possible but this usually comes at a price. At Skin Renewal we have recognized this problem and have come up with a customized solution to make it more affordable by combining Laser Genesis in an affordable package over a period of time. As best results are seen after 6-8 treatments, every client is provided with a fully customized yearlong solution, dependent on the patient's age, relevant skin problem, budget and expectations. The effects of each treatment is accumulative meaning that the results of each previous treatment is improved with each additional treatment and the best results come down the line when new collagen that is stimulated remodels and a further tightening effect is noticed. Are Laser Genesis Rejuvenation treatments available at all Skin Renewal branches? 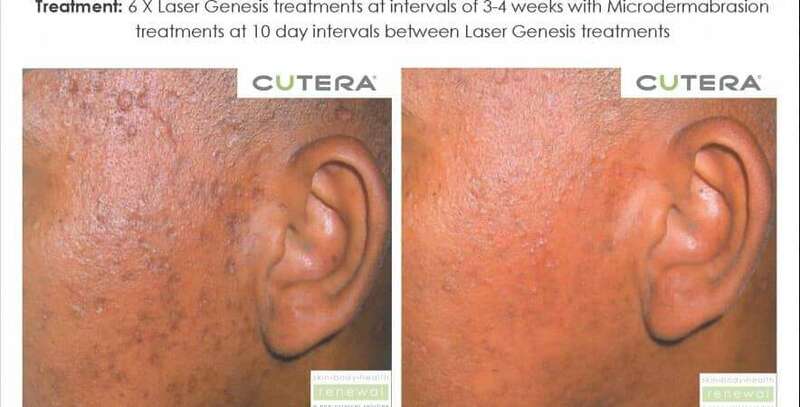 Laser Genesis Rejuvenation treatments are available in Johannesburg at Fourways, Parkhurst, Morningside, Bedfordview, West Rand and Illovo as well as in Pretoria at Brooklyn and Irene and in the Western Cape at Cape Quarter, Claremont, Constantia, Stellenbosch, Willowbridge, Paarl and KwaZulu-Natal at Durban & Umhlanga. Laser Genesis™ skin therapy is an innovative, technologically and and advanced way to promote vibrant and healthy looking skin in men and women of all skin types. The Laser Genesis™ procedure has been scientifically proven to produce new collagen. The Laser Genesis™ procedure utilizes non-invasive laser technology to safely, discretely and effectively improve those conditions that are typically associated with the premature signs of ageing and sun damage, such as excessive redness, large pores, uneven texture, sallow complexion, acne scars and wrinkles with no pain or downtime. What awards has the Cutera Nd: YAG won in the international market? In 2005, 2006 and 2007, in the USA, the Aesthetic Trends and Technologies Choice Awards™, nominated the Cutera Nd: YAG for the non ablative laser for collagen remodeling. What other conditions can be treated with the Laser Genesis procedure? Our innovative new treatment settings for the Laser Genesis™ procedure has dramatically improved our results for more difficult to treat skin problems such as deeper wrinkles, acne and superficial scarring. Laser Genesis™ treatments can also be used to plump up the lips with no pain or downtime, and can also be focused on small, specific problem areas that need rejuvenation, such as the nose, the mouth, the eyes and the hands. Laser Genesis™ also improves the appearance of stretch marks especially if combined with Carboxytherapy and/or Skin Needling or Dermapen. For redness and Rosacea, the Laser Genesis™ procedure shrinks the tiny red veins causing the diffuse redness. If combined with a Limelight procedure, a superior result can be expected. Both these treatments improve Rosacea but do not cure it as Rosacea is a chronic condition that needs lifetime management. For Epidermal melasma, Laser Genesis™ facilitates the breakup of the superficial epidermal pigmentation and helps prevent melasma recurring post treatment. In cases where melasma is both epidermal and dermal, other treatment modalities need to be included to affect a better result. With Laser Genesis you can expect to see subtle yet consistent results after each treatment, without unwanted side effects such as swelling, redness or excessive skin irritation as one sees with more aggressive laser treatments such as the newer fractionated treatments. Treatments can be performed in a relaxed, comfortable manner without the use of topical anaesthetics or gel. 6-8 treatments are needed for most of the treatments mentioned above. In severe cases, additional treatments may be necessary. How does Laser Genesis™ work? 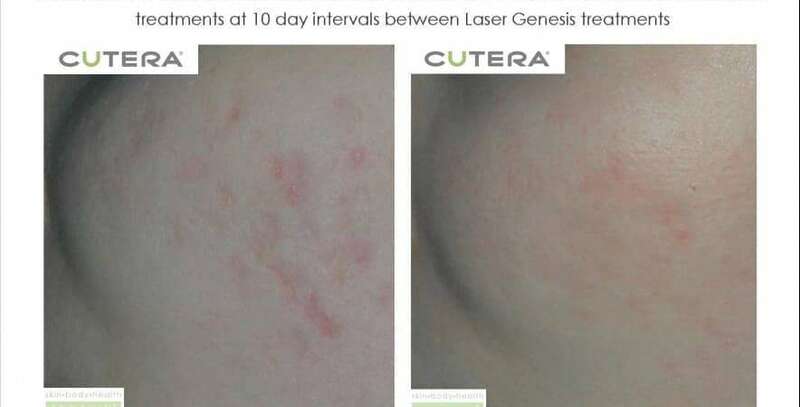 Laser Genesis™ heats up the papillary dermis and stimulates collagen production.The laser light is also used to target superficial pigmentation as the pigment acts as a target which draws the laser light, which is converted to heat in the skin tissue, destroying the pigment within the skin cells. In addition, Laser Genesis shrinks the micro blood vessels of the papillary dermis which reduces and improves diffuse redness. For redness the treatment results are often subtle. On average, you may require four to six treatments in order to achieve optimal results, but in severe cases, more treatments may be required. It is also essential to combine these treatment with the appropriate maintenance products and good sun protection. Laser Genesis combined with a Limelight procedure is Skin Renewal's best treatment option for redness and Rosacea. The redness and flushing improve dramatically but these treatments are not a "cure" for Rosacea which is a chronic condition that needs lifelong management. Every patient's condition and needs vary and thus between 6 and 8 treatment sessions are needed for optimal results. For more information about your expected results or the number of treatments necessary, please consult the aesthetic doctor at your nearest Skin Renewal Branch, where your attending Doctor will be able to provide you with some insight. How has the Laser Genesis protocols changed to ensure better results? After doing literally thousands of procedures, safe innovative protocols and treatment settings have been introduced for our Laser Genesis procedures. These new settings are resulting in dramatically improved results for deeper wrinkles, acne scars and superficial scarring in patients of all skin colours and all with no down time. These new protocols have now been introduced into all our packages including the 3 D Skin Rejuvenation™. For most conditions 6 to 8 no downtime treatment sessions are necessary for the best results. What kind of textural improvements can you expect with Laser Genesis™ skin therapy? Over the course of six to eight treatments, Laser Genesis™ can help restore the skin's youthful glow and appearance by smoothing out uneven texture caused by ageing, sun damage or acne scars. You will see a more even, healthy complexion as large pores are reduced in size, and minor imperfections are diminished. The skin is also brighter and the sallowness which comes with ageing is improved on. The individual treatment results are subtle, but the overall effect of multiple treatments can be quite dramatic especially if Laser Genesis™ is combined with other procedures. The skin's elasticity and collagen content improve over time. Acne scars, previously difficult to treat in skin of colour, improves after a series of 6 to 8 treatment sessions of Laser Genesis. When should one start Laser Genesis™? As one ages, the skin's elasticity declines dramatically, wrinkles become evident and our skin takes on a sallow complexion. One of the earliest signs of facial ageing is the development of fine lines and wrinkles. Previously there were no non ablative alternatives to laser resurfacing. The choices were fairly black and white; ablative resurfacing such as CO2 or wrinkles! Now with the advent of non ablative laser techniques such as Laser Genesis™ and skin rejuvenation procedures such as 3D Skin Rejuvenation, virtually any patient in their thirties or above can be a candidate for a little rejuvenation and the younger the patient the better the result, as the skin has a better ability to rejuvenate. After a series of 6 to 8 treatments, ten out of ten patients will be putting collagen " in the skin bank" for the future. Perhaps even more promising is the idea that treating skin with lasers earlier on in the ageing process-at around age 30+ may actually slow or prevent the skin from breaking down and appearing wrinkled and saggy later on in life. At Skin Renewal thousands of Laser Genesis™ procedures have been performed without any side effects. After the procedure there may be slight redness that disappears within a few minutes of treatment. Can Laser Genesis™ treatments be combined with other procedures? At Skin Renewal Laser Genesis™ is part of our signature treatment; Skin Renewal's 3D Rejuvenation™. In addition, Botox and Fillers (The Liquid Facelift) are commonly performed after a 3D Skin Rejuvenation™ procedure. This combination is one of the most widely used and most effective methods of achieving a significant aesthetic improvement of wrinkles within 3 to 6 months when the effects of laser rejuvenation become evident. At Skin Renewal we also include Carboxytherapy and/or Skin Needling of the face and neck to further improve wrinkles and sagging. Can Laser Genesis™ be used on all skin types? Yes, Laser Genesis™ safely treats all skin types without significant pain or down-time. At Skin Renewal Laser Genesis™ has been safely used to treat acne scars and pores in many of our darker type 5 and 6 skins with no side effects. My therapist is very professional and informative about treatments and procedures or products. She is considerate and friendly without being overly chatty. Her treatments are always pleasant and I feel confident that they are helpful and I'm in good hands. Review -"My Skin Renewal Experience"
I have been to dr Tarryn for various anti-aging treatments over the past two months, and not only am I extremely happy with the results, but I am also very impressed with the wonderful way that they have treated me as a person. Every time I leave, I feel great inside and out. I will definitely continue my treatments in the future. Thank you everyone at Skin Renewal Constantia. Review -"Happy with my treatments"
Happy with my peels and laser genesis. Epipen is double the price compared to an independent beauty salon. Great interpersonal skills and lovely atmosphere. Review -"Happy with results and recommendations"
I've had a range of treatments by Deane ranging from laser, peels, PDT, carboxy, and deep cleanse facials. She is always friendly and professional and explains each treatment thoroughly. Have been made several recommendations I'm very happy with the results. Appreciate that my budget is considered. Always made to feel comfortable and never rushed. Fantastic service, always the best advice for my skin concerns. Highly knowledgeable and always friendly. Thank you! Whenever I visit Constantia Skin Renewal I am always welcomed by the amazing women who are making up this very special institution. Their kindness and friendliness just add to the professionalism they have. Their product knowledge is also appreciated. Makes coming here something to look forward to. Thank you Ladies. Review -"Renew of skin care treatment"
I received my bimonthly facial at the Constantia branch today. As usual the service, attention to detail and professionalism I received was excellent. Thank you for looking after me so well and making me feel comfortable and relaxed throughout my treatment. The SR Team were very informative, providing insight and advise on different treatments that would best accomplish the results I wanted. I would highly recommend this team. Review -"Professional, thorough, attentive and careful"
She is by far the best of all characteristics in the heading of this review, of all the treatments I do here. She has also been the most caring about the sustainability of my treatments, by suggesting only the most needed products for my skin. This is the best investment of mine, and my therapist is instrumental in making it so. She is the best. My therapist has been my 3rd therapist at the Renewal Institute over the past 1,5 years I've been having treatment. She is by far the best of all characteristics in the heading of this review, of all the treatments I do here. She has also been the most caring about the sustainability of my treatments, by suggesting only the most needed products for my skin. This is the best investment of mine, and my therapist is instrumental in making it so. She is the best. The staff are always friendly and professional. Thank you so much for the treatment. It's always a wonderful experience to come to the Constantia branch. The staff are always friendly and professional. Not only is my experience great but my skin looks amazing. People has mentioned to me that I look 10 years younger. My cellulite is the only thing that does not appreciate this warm gentle, trusting human being. Which I don;t mind. Highly recommended! Candice has been my therapist for the last 6 months. From day 1 she has always been professional and welcoming.Not only is my experience great but my skin looks amazing. People has mentioned to me that I look 10 years younger. My cellulite is the only thing that does not appreciate this warm gentle, trusting human being. Which I don;t mind. Highly recommended! I look forward to my monthly treatments and feel each month is treated as a specific focussed treatment as apposed to a routine schedule. She is a lovely presence throughout the hour I am there and feel she really is the most experienced therapist. My therapist is an outstanding therapist. She is gentle, professional, highly knowledgable and passionate about what she does. I look forward to my monthly treatments and feel each month is treated as a specific focussed treatment as apposed to a routine schedule. She is a lovely presence throughout the hour I am there and feel she really is the most experienced therapist. The staff is very professional, and my therapist is very good. She knows what she is doing and handles everything on a professional base. Review -"Loyalty Treatment from Loyalty places"
I've been under her care for a few years and I havee never been disappointed. Excellent and professional service. Ilona is very knowledgable about skin care and I trust her completely. I've been under her care for a few years and I havee never been disappointed. Review -"Professional skin care at its best"
My therapist is very professional. I have been with several treatments with her and she always makes me feel comfortable and relaxed. She is very knowledgeable about the different treatments Skin Renewal offers and I regularly follow her advise when buying new products. My skin always feels great after treatments. I would recommend this investment in skin care to anyone and I would definitely recommend her as a therapist. Review -"Beautiful People to deal with"
Dr Tarryn has an approachable, friendly nature. She is light-handed and very professional. Penelope and Jessica are beautiful people to deal with. Very pleased with my experience at this branch. Sharon. She explained everything and has amazing hands. I enjoyed it very much. I had an amazing and thorough treatment with Sharon. She explained everything and has amazing hands. I enjoyed it very much. It was so nice. So relaxing. Massage was fantastic. Always nice to visit Helette. Helette at Willowbridge fo a couple of years and my skin is radiant. the anti-ageing results achieved is much more than expected! I have been a customer of Helette at Willowbridge fo a couple of years and my skin is radiant. the anti-ageing results achieved is much more than expected! Review -"Super Experience - Highly recommended!" Charleen assisted me when I came in for a free consultation on products to purchase. I was so impressed with my overall experience from her demeanor and professionalism, to her polished client service. Not only do I now purchase a whole skincare regime from Skin Renewal thanks to her recommendation, but I also now come to her for peels and laser-gen and my skin feels incredible. This is a true example of exemplary service that makes you feel great as a client regardless of cost. 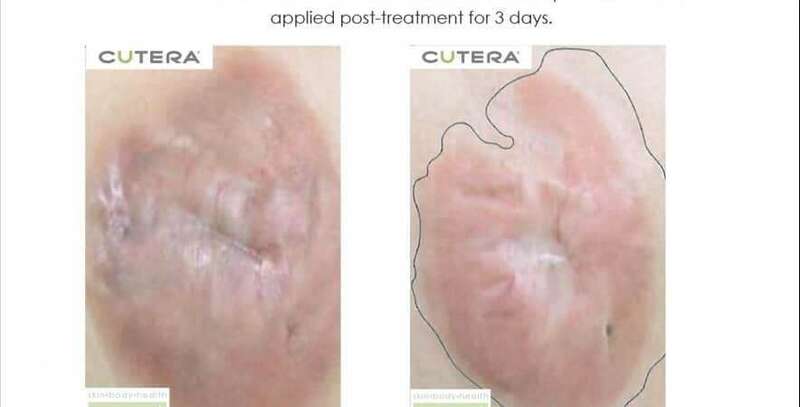 Review -"Great results after many treatments"
I've been receiving keloid treatment for almost 2 years with brilliant results but the reason for constant return has been the phenomenal reception and treatment by the therapists, staff and treating doctors. Whilst the journey has been difficult, it's been under the warmest conditions of care and kindness. Thank you to the ladies at Skin Renewal, our relationship will continue long after the keloids are gone! Review -"Very Professional Skin care"
Marzet & the Sin Renewal Constantia team very friendly, organized, caring and highly professional. The treatments I have been having have been highly effective. I find Marzet & the Sin Renewal Constantia team very friendly, organized, caring and highly professional. The treatments I have been having have been highly effective. After just one treatment of lasergenesis and Carboxy, my inflamed acne and nodules on my forehead and face reduced within the same day of treatment. I highly recommend the above treatment for acne related problems and the staff at Skin Renewal in Parkhurst are extremely helpful as well. Review -"Birthday Treat - Thank you!" A big thank you to Skin Renewal for my Pearl Loyalty Birthday Facial present. Dourina, you are a jewel of a person, thanks again! Review -"Tailored and personalized treatment!" My skin has shown great improvement since starting to come to Skin Renewal Cape Quarter. People used to think I was older than I am, now they think I am younger! The tailored treatment plans and personal touch makes all the difference. I highly recommend Skin Renewal and my therapist. I have always had Excellent treatments at Skin Renewal Parkhurst. Staff are attentive to conditions of skin and changes. Treatments are performed as required and the ladies are excellent therapists. Review -"Treatment of high standard"
Service very good. Treatment of high standard. Enjoy coming here. Thanks for always accommodating me, nice that one can come early morning. Will recommend treatment and service to friends. Review -"Definitely recommend Skin Renewal"
She is an amazing therapist I have been coming to her for almost 2 years now and have always had a great experience. I have recommended her to many friends and family members. I am very pleased about the service and professionalism. My skin is looking radiant and healthy again. She is truly great and professional and proactive! Liezel is a great therapist, always on time and thorough. Xen has always recommended appropriate treatments. Overall very happy and trust Skin Renewal. Always great honest service and feedback. Liezel is a great therapist, always on time and thorough. Xen has always recommended appropriate treatments. Overall very happy and trust Skin Renewal. Baie professioneel, vriendelik en gee goeie raad vir my vel. Tammy probeer nie allerande onnodige produkte aan mens verkoop nie, maar gee die gevoel dat jy is in bekwame hande. Ek is 'n uiters tevrede klient. Always friendly assistance. People make you feel comfortable and at home. Always a pleasant experience. I am extremely happy with the service. I also appreciate that the branch is very understanding of my schedule, in that they are never grumpy when I request to move appointments. I couldn't trade the service of the branch for anything. I have always had a wonderful experience at Skin Renewal Claremont. Idalia is an exceptional therapist. Relaxed supportive treatments .Let me feel comfortable and not self conscious. Impressed with product knowledge and equipment. I really enjoy my monthly visits to Brooklyn Skin Renewal. The excellence of everything from the reception to the treatments is highly appreciated. I feel as if all the girls are part of my extended family. Such a Fantastic experience-from the first consultation to all the treatments. Everything is explained in detail, you are never persuaded to do/buy anything that is not in your best interest, and so lovely feeling that you are in good hands with people who know what they are doing and who will help you reach your goals. Such a worthwhile investment, money better spent than on over-the-counter products. I just wish i had started earlier! Review -"The overall service is refreshing!" The overall service is refreshingly professional and yet caring and it was a deciding factor to me that one's treatments are tailored by a medical Doctor. Tammy, my therapist, is always prepared and knowledgeable and there is no way of forgetting about your appointment since the salon reminds one a day before via SMS. Perhaps most pleasing of all is that my skin has significantly improved due to the careful treatments. Second treatment, since assessment and I can see visible improvement in my skin. It's brighter and the pigmentation around my mouth and the pigmentation from acne scaring has improved. Can't wait to finish course of treatment to see full results. Review -"Best Service & Friendly staff"
Skin Renewal - Brooklyn - Best Service & Friendly staff, would always walk the extra mile to help! I always feel welcome and can't wait for my next appointment. Review -"Great service from my therapist!" Angelique Chaplin has been my therapist on a number of occasions; she's always warm and very pleasant. She always explains the procedure to me, gives advice about my concerns; I feel safe and cared for when she's treating me, very friendly demeanor. Angelique Rademeyer is another amazing therapist! She's my regular therapist and makes me feel like family now. Always helpful, always friendly, warm and gives excellent advice about my skin. I thoroughly enjoy being treated by both these wonderful ladies. Review -"improvement after only 4 treatments"
Die diens is baie goed en ek hoef nooit vir my afspraak to wag nie. Die personeel is altyd vriendelik en probeer om jou altyd op jou gemak te laat voel. Excellent and friendly service, especially the branch manager, Donne. Staff are professional, friendly and very informative. They answered all of my questions and concerns. Highly recommended! Review -"Reassuring staff at Claremont"
My first experience of Laser Genesis and I did not know what to expect. But Idalia made me feel less stressed and very reassured. Excellent therapist and a very relaxing environment. The treatment was successful. To Tammy and Skin Renewal. Thank you for your fabulous and outstanding personal care. Tammy your peels & laser treatments are outstanding, Many thanks!